There may be a light at the end of the tunnel for Seadrill if a few things go right in 2017. Seadrill Limited (NYSE:SDRL) has had a terrible run over the last two years as oil prices dropped and offshore drilling demand dried up. But the last few months have brought a little hope to the industry and Seadrill itself. Rising oil prices could eventually lead to more demand and stronger earnings and revenue. Here's what Seadrill needs to see its stock rise in 2017. 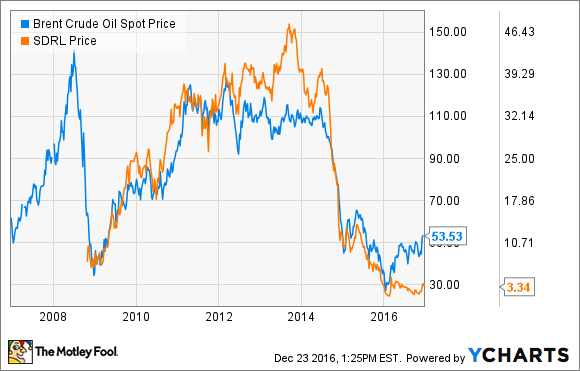 There's no better indicator ow where Seadrill is headed than the price of oil. As oil went up after the recession so did Seadrill stock and when it plunged in 2014 the stock did as well. There are lots of other factors involved in the offshore drilling business, but Seadrill needs oil prices to rise to recover. And no other factor could drive the stock up higher or faster than oil. If the price of oil does rise the next step would be for drillers to start signing contracts for new offshore drilling wells. And Seadrill needs to start seeing those contracts come in. You can see below that backlog for Seadrill is just $3.0 billion and it falls off a cliff in 2018, which could bring the company's survival into question. Image source: Seadrill Q3 2016 investor presentation. To put this backlog into perspective, total Seadrill Group backlog was $7.0 billion at the end of the third quarter of 2016. Two years earlier the backlog was $24 billion. The lack of drilling contracts has put all drillers in a tough position, but Seadrill has been hurt by its focus on ultra-deepwater and a debt load that can't be sustained by its current level of revenue. At the end of the third quarter Seadrill had $6.7 billion in long-term debt and $3.1 billion in short-term debt, meaning it's due in a year or less, compared to just $93 million in cash. Without some sort of refinancing the company would either have to sell a lot of shares to raise funds or it could go bankrupt. Management has said they're talking with lenders to "re-profile and defer all bank facilities" and restructure debt covenants. There could also be a new capital raise in some sort of restructuring. And how those negotiations go and what the cost of new debt is will be key to the stock going forward. Investors will want to see that Seadrill gets financing that will last long enough to see oil prices return to higher levels and see a corresponding increase in spending by oil and gas explorers. If it can get that stability the stock could have a lot of upside. If not, it's in serious trouble. At the end of the day, Seadrill's financial future really relies on oil prices moving higher and explorers starting to spend on drilling again. If that happens the stock will rise and if it doesn't investors should brace for the worst.